A VERY wise Latin American statesman remarked at the Emerging Markets Forum in Paris this month, quoting the Nobel Laureate writer Octavio La Paz that after the French Revolution, the 19th century was all about the search for liberty, the 20th century about equality and the 21st century should be about fraternity. The concept of liberty and individual freedom was sparked by the French Revolution but it became embodied in the American constitution that individual freedom was almost absolute in its right. Before then, rights were communal and determined by the state, or at least by an elite. With the rise of American might, the primacy of individual rights became widespread, because it appealed to the individual ego and the right for self determination. But man does not exist alone – he lives in a community in which rights come with responsibility – self-respect must also be tempered with respect for others. The 20th century was a flowering of the capitalist spirit, that individual greed can lead to public good. This drove unprecedented prosperity, unfortunately unequally shared. The saving grace was the narrowing of income and wealth differences between the rich nations and the developing economies, but in almost every country, income and wealth gaps widened. This has reached the stage where views are increasingly polarised, with huge gaps in understanding between genders, generations and geo-political powers. Gandhi was the one who rightly pointed out that the world has enough for all our needs, but not our greed. The global financial crisis of the 21st century exposed all the flaws of the dominant thinking, that the American Dream is sustainable. It was already doubtful that it could be sustainable for a few, but if the population of the world reaches 10 billion by 2050, we will be so crowded and in each other’s face and space that how to achieve fraternity without war will be the question of the century. The Emerging Markets Forum in Paris was the occasion for a book launch on “The World in 2050”, a study by various leaders, such as former German Chancellor Horst Kohler, former IMF managing director Michel Camdessus and former presidents and ministers of several emerging markets. The book, edited by former World Bank director Harinder Kohli, tried to think through the major issues of the 21st century. The major theme was essentially demographic and geographic – by 2050, the largest populated nation will be India, but the third largest could be Nigeria, with Africa emerging as the third largest continent by population and growth. The study is timely because there are already signs that the borders that were delineated by the former colonial powers in Africa and the Middle East are already breaking down as failed states, arising from bad governance, exploding population and climate change stresses leading to civil strife, outright war and now mass migration. This mega-trend of global migration, which is already happening legally in the form of migrant workers and illegally in the form of economic and political refugees, especially into Europe, is going to disrupt the current order. Can Europe absorb over a million migrants a year without major changes in culture, living standards and law and order? How would these new migrants, including families that will follow, be accommodated, given already high levels of unemployment and shortage of housing in many European cities? Without proper accommodation and social acceptance, will there be more terrorist outbreaks and civil strife that disturbs the comfortable lives of Europeans today? Even as Grexit (the possibility of Greece exiting the eurozone) has quietened down, Brexit (the possibility of Britain exiting the European Union) is becoming a looming nightmare. Whether Britain leaves or not is going to be an expression of how the British people feel about fraternity with Europe. All economic logic seems to suggest that Britain should stay. Germany needs Britain to maintain the balance of power within Europe, because British level-headed diplomacy is a useful counterweight to the more romantic (and less fiscally disciplined) southern members, such as France, Italy and Spain. There is genuine worry that the refugee crisis will make the stoic British more isolationist, preferring fraternity within the British isles. From an Asian perspective, the stability and prosperity of Europe is an important anchor to global peace and stability. Europe is not only a major trading partner but her moderation and common sense is often a useful counterweight to American exceptionalism, whose mistaken invasion into Iraq triggered the breakdown in the Middle East order. Perhaps the status quo in the Middle East was always fragile, made more fragile by growing population, low oil prices and climate stress. The borders of the Middle East and Africa were the legacies of the Great Game in the 19th century, when former colonial powers carved up these areas into territories that ignored tribal or geographic realities. Today, these borders are being ignored by non-state players, and peace and order will not return till we find a solution to creating jobs in situ for the growing youth that are increasingly armed and willing to fight for their rights. Throughout history, it has always been the unemployed and disaffected youth that has led to revolution or war. China’s One Belt One Road strategy can best be understood as a building of roads, rails and ports to link Eurasia together, creating new trade routes over old historical paths. For the first time, this will be a linking of roads and rail between China and India, and through central Asia, almost into the heart of eurozone, north to Russia and south to Africa. The investment in the infrastructure and in jobs for the young is the best hope to avoid massive social upheaval. This is the 21st Century Great Game - whether to live in fraternity or fratricide. 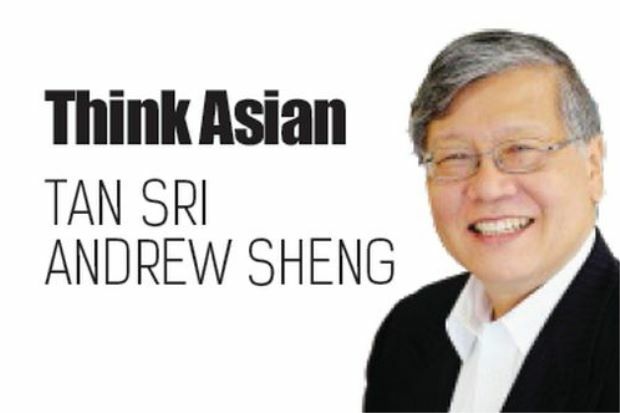 By Andrew Sheng writes on global issues from an Asian perspective.